The kitchen faucet is one of the most important fixtures in your home because the majority of kitchen activities like filling pots, washing dishes, and preparing meat and vegetables happen at the sink. Faucet design and supply companies, like industry leader Moen Faucets, understand this and have stepped up to the plate in creating a number of cutting edge faucet designs to fit any homeowner’s fancy. When choosing your kitchen’s faucet, you will first need to decide between two types of delivery systems: single or double handle. 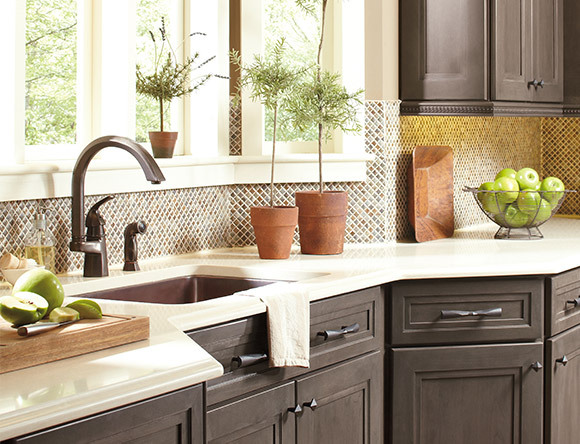 For a kitchen, single handle faucets are hands down the best choice. Why? Because when you are cooking a meal, you do not always have two hands to work the handles. In fact, sometimes you do not even have one, so having a single handle faucet you can turn on and adjust with your elbow or free hand will save you time and frustration. The only exceptions are if you live in a historic home or if your kitchen design harkens back to an earlier age, a double handle faucet might better match your home’s traditional aesthetic. Once you have settled on a handle style, your next decision is faucet height. Generally, in kitchens, the higher the spout the better. Cheap faucets that barely rise above the height of your sink will make everything from washing your hands to filling pots a frustrating chore because you will need to lean down to get anything done. Take a hint from one of the leading designers: Moen kitchen faucets are almost exclusively built with high, arched faucets. 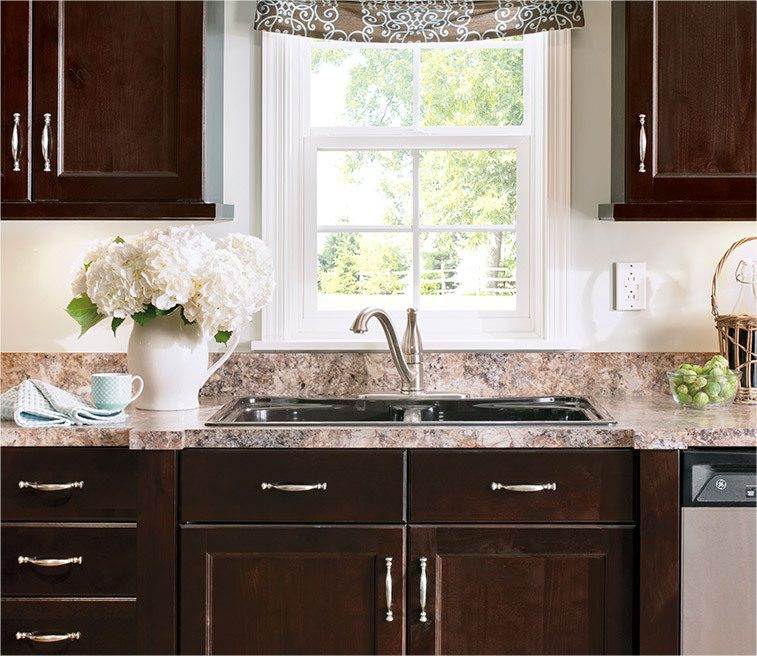 After deciding your handle style and faucet height, the rest of your kitchen faucet choices are all about the luxuries. 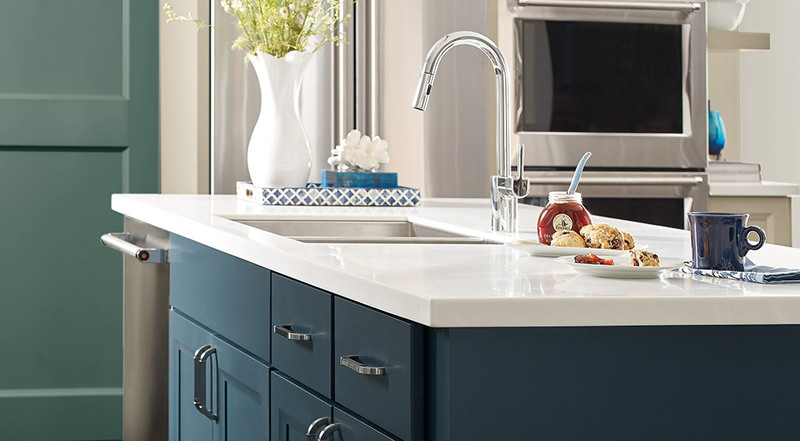 Companies like Delta and Moen faucets are committed to meeting your every need with a number of innovative faucet features like touch technology and pull-down sprayers to make your kitchen experience as easy as possible. 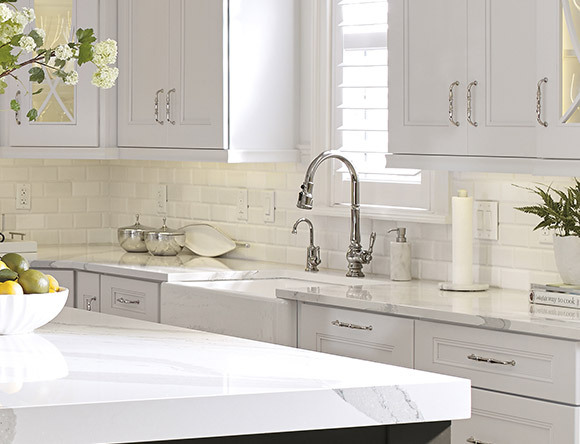 The kitchen faucet is one of the most important fixtures in your family’s kitchen, so purchasing a high-quality faucet that matches your aesthetic and personal style is one of the most important and best investments for your home. 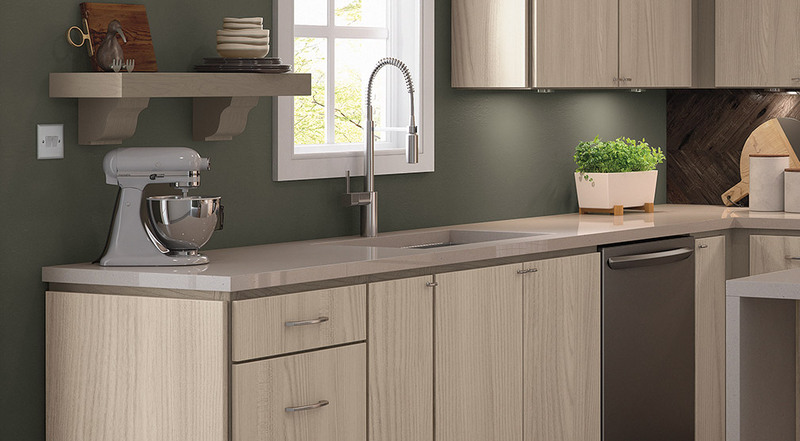 With thousands of faucet options from the industry’s top brands like Moen Faucets and Waterstone, Henry Kitchen and Bath has the kitchen faucet that will serve your family for years to come. With a new water dispenser faucet, your family’s days of filling water jugs, bulk buying water bottles, or drinking unfiltered tap water are over! A water dispenser faucet is a separate spout that is attached to a water filtration system and typically located on one side of the main kitchen faucet for convenience. For homeowners concerned with water quality, this faucet is a necessary addition because it provides pure, filtered water right at your fingertips. Water dispensers come with the option of providing cold water, hot water, or even both hot and cold water, so you can pick the water dispensing system that works best for your family’s needs. 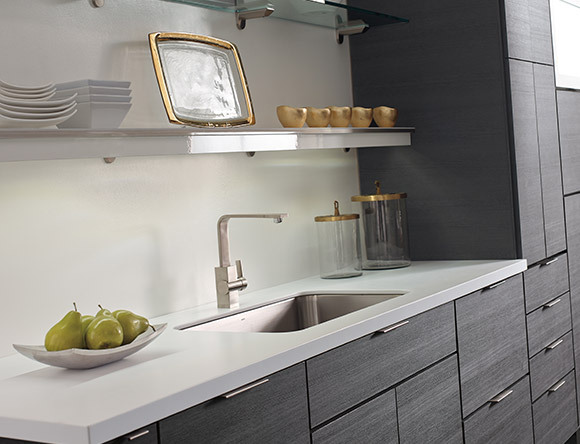 Bar sinks are the perfect addition to busy households that value entertaining and communal cooking. While bar sinks are ideal for hosting friends and family, they can also be used as a secondary food prep area in large, hectic homes. 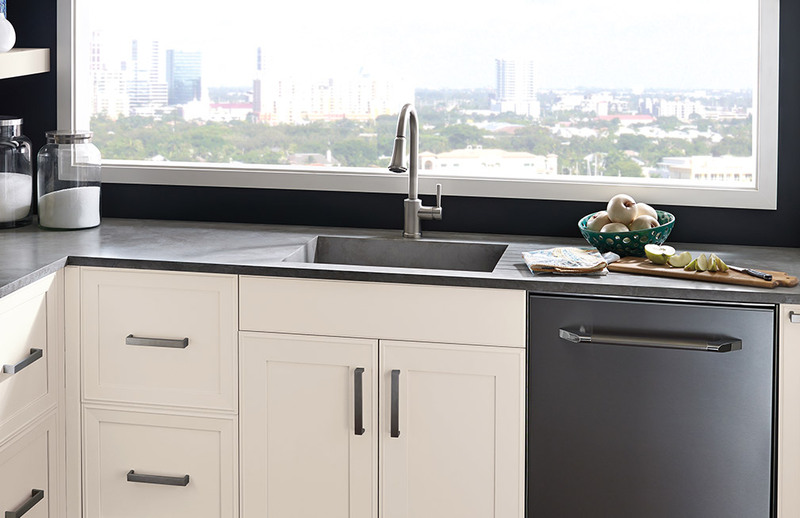 Because bar sinks are typically smaller and in a less prominent place than the main kitchen sink, you can take more creative risks in the design and finish of your bar sink’s faucet to make it stand out in your kitchen while also keep your home’s style. With many add-on options like pull-down spouts and smart-touch, you can find your home’s perfect bar sink faucet at Henry Kitchen and Bath. Pot Fillers are one of the newest and coolest innovations in faucet design. Lugging around pots full of water is the worst job in the kitchen, short of cleaning up, so why not install a separate faucet over the stove to eliminate those grueling trips from your family’s home? Pot filling faucets are built with multiple hinges, so they can swing out over any burner and be pushed back against the wall and out of the way when you are finished using them. While quickly filling large pots is their most common use, pot fillers can also simplify a number of tasks such as replenishing vases that have fresh flowers, filling your morning coffee pot, or loading up the humidifier tank. 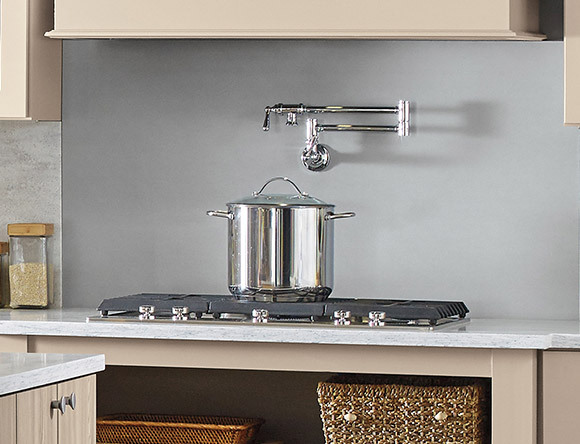 With hundreds of different brand, color, and style options, Henry Kitchen and Bath has the perfect pot filler to match your unique aesthetic and make your kitchen work better for you! Kitchen faucet parts can be as important as your choice of kitchen faucet in creating a functional, easy-to-use water-delivery system that works best for your family’s needs. There are many necessary faucet parts like diverters that direct water to the correct outlet and deck plates that cover the hole in the countertop where pipes and faucet supplies come through, as well as useful add-ons like sprays that detach from the primary faucet for easy cleaning. Whether you are looking to replace a specific faucet part or upgrade your entire water-delivery system, Henry Kitchen and Bath has thousands of parts from the industry’s top brands to get your faucet working best for your family’s needs. At Henry Kitchen & Bath, our designers provide expert advice about which type of faucet is best for you and how to properly install it. While your sink will dictate to some extent how many features you can implement, there are many new faucet innovations you can select to improve the convenience and function of your kitchen. As faucet features have become more complex, however, so has their installation, so hiring an experienced professional is the best way to ensure that everything will run smoothly when you turn on the water using your new kitchen faucet. 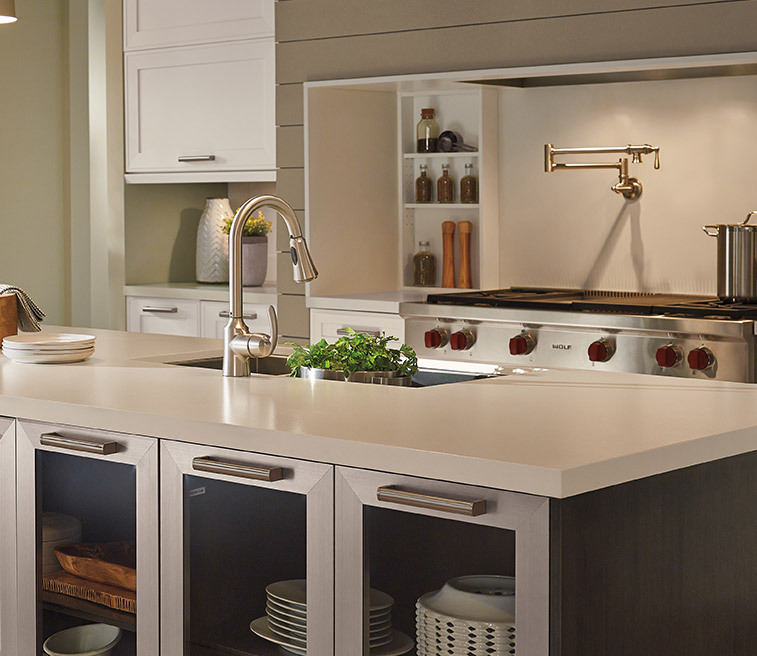 For your next kitchen remodeling or renovation project, choose Henry Kitchen & Bath - We can make your dreams come alive.